Lake Ritsa (Abkhaz: Риҵа, Georgian: რიწა, Russian: Рица) is a lake in the Caucasus Mountains, in the north-western part of Georgia, surrounded by mixed mountain forests and subalpine meadows. Its water is cold and clear. Mountains with heights of 2,200 to 3,500 m surround the lake. 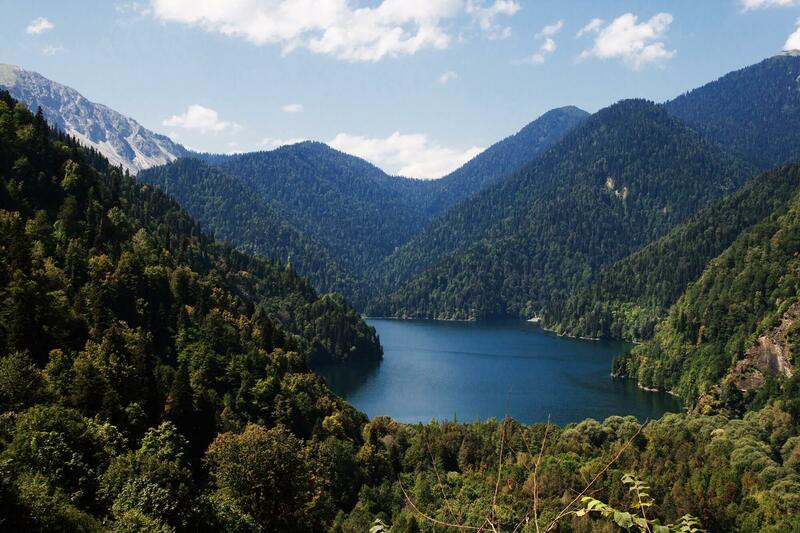 The region around Lake Ritsa is a part of the Euxine-Colchic deciduous forests ecoregion with a fairly high concentration of evergreen boxwood groves. Many specimens of the Nordmann Fir, which reach heights of over 70 metres (230 ft), are found around the lake. In 1930 the Ritsa Nature Reserve (162.89 km2) was established to protect the natural state of the lake and the surrounding land. The road from the Black Sea coast was built in 1936. The lake was an important tourist attraction during the Soviet period. It is still frequented by Russian tourists. Lake Ritsa is one of the deepest lakes in Georgia (116 m), and is rich in trout. The average annual temperature in the area is 7.8 degrees Celsius (January −1.1 °C, August 17.8 °C). The mean annual precipitation is approx. 2,000 - 2,200 mm. Winters are sometimes snowy, summers warm.